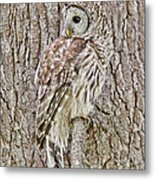 Barred Owl Camouflage by Jennie Marie Schell - 6.500" x 8.000"
Barred Owl Camouflage framed print by Jennie Marie Schell. Bring your print to life with hundreds of different frame and mat combinations. Our framed prints are assembled, packaged, and shipped by our expert framing staff and delivered "ready to hang" with pre-attached hanging wire, mounting hooks, and nails. Now, that's what I call "active camo"! 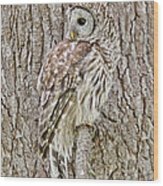 Congratulations Jennie, your work is Featured in "A Birding Group - Wings"! 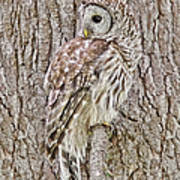 A curious Barred Owl being camouflaged by the brown bark of a Fir tree. Copyright by Jennie Marie Schell. All Rights Reserved. Digital Millennium Copyright Act of 1998. No content maybe downloaded, transmitted,copied, reproduced,altered,transferred, published, pinned, without the permission of the photographer.